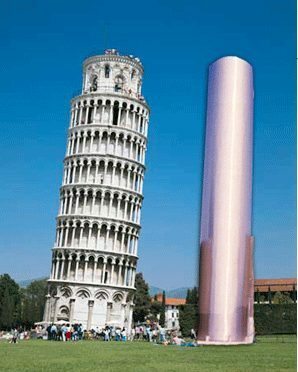 Kentucky – One can easily make the parallel with the Leaning Tower of Pisa when a Kentucky food plant’s 50,000 gallon milk tank started to sink. Below is URETEK’s project report results summary from a project that required URETEK’s patented Deep Injection Process to densify weak soil strata that was the source of a food plant’s 50,000 milk tank to sink and become unstable. The new tank began to exhibit settlement problems of .44 to .74 inches. The adjacent building foundations to the north & south, had also suffered settlement from the tank loading. The 14’ x 15’ tank foundation pad is thickened on the edges to 4’-7” thick, and is bedded on #57 bedding stone to approximately five to seven feet deep. There are no piers or anchors under the foundation. The tank is eccentrically located on its foundation pad, (not centered), approximately one foot to the north of the east-west axis, along the north-south axis line. The desired repair results require the compaction/densification of the fill materials and soils under the tank pad & adjacent building foundations, to stop further settlement of both the tank and the walls. Raising the foundation pad .5” is desired, but not mandatory. The soils report shows a highly compressible, saturated & weak, silty soil situated over a medium stiff layer of silty soils at around 8’ or 9’ deep. The entire plant facility is supported on this medium stiff layer and it was thought that the tank could likewise be supported, if the intervening saturated layer was stabilized down to this medium dense layer. The plant’s use of the tank while stabilization occurred was cons idered beneficial, as the loading & unloading of the weight would assist in the densification process. URETEK was concerned about the eccentric loading of the north end of the tank pad as it impacted upon the foundation of the processing room’s south wall. The processing room’s south wall was acting as a buttress against the eccentric load of the tank. Our concern was in how to correctly break the bond of that support during our injection process, which would shift the eccentric load. This could induce differential settlement under the tank, in these saturated weak compressible soils, which held possible dire consequences in loss of control. This concern influenced our selected pattern of injection. The first order of business was to take preliminary grade elevations, and to perform the pre-injection penetrometer soil density tests. Two penetrometer tests were performed. The first site (P-1) was positioned at the northeast corner of the pad, angled to the west through the sidewalk, at sufficient angle to clear the bottom of the foundation. P-1 was driven to a depth of 6 meters (20 feet). P-2 was located approximately three feet inside the receiving room door, angled to the north, and driven to a depth of 6 meters. The attached graphs show the blow count numbers. The top down injection plan was to start on the south side of the tank foundation pad to create a stable bench within the foundation soils, to support the tank when the north side bond with the processing room wall was released. The west, east, & north sides were then likewise injected to the six-foot elevation. By the end of the day, thirteen of the fifteen, tank foundation pad injection probes had been injected to the six-foot elevation. Injection continued on the north end of the pad at both six and nine foot elevations to fill and densify the weak soils. The results were a small 2 to 4mm of lift on the north pad and processing room wall. Work shifted to the interior of the processing room on Sunday, while the plant was at rest. The south processing room wall was injected to both six and nine foot elevations. URETEK injected material under the wall foundation, through six probes at three locations, resulting in stabilization and approximately 5mm of lift. Work moved back to the tank foundation pad as injection probes were placed to the nine-foot depth, but were backed off to the eight-foot elevation when hard resistance was encountered at nine feet, a good sign. Actual injection started at 10:00 a.m. Muddy organic water was forced from adjacent injection probes while the injection work took place. As the injection work continued, back pressure and pump resistance continued to build at this lower elevation as more material was injected. Work on the pad progressed from the south to the north, until around 2:30 p.m. While injecting the last holes at the northeast corner of the pad, there was observed a slight opening of the north pad face and the south processing room wall interface. The monitoring laser eyes showed a 2mm lift on the processing room wall & the north pad, and a corresponding 2mm drop on the receiving room wall, indicating a fulcrum moment shift of the load. The crew installed injection probes #’s 20, 21, & 22 angled under the receiving room wall to a depth of six-feet. The underlying sands and gravels were very loose and wet to that elevation. Addition injections void filled & densified the soil under the wall. During the injection process closest to the receiving room, previously detected wall cracks closed. Tuesday, work continued in the receiving room area. Repeated attempts were made in trying to drill and drive injection probes past the six-foot elevation, with no success. The post P-2 penetrometer test was then conducted under the receiving room wall, close to the preliminary P-2 test that had been driven to 6 meters deep with low blow counts. The post P-2 test was terminated at 1.5 meters (5 feet) with blow counts of 350 blows per 10cm! The preliminary test had shown voids and single digit blows to this elevation. Typically, the test in stopped at 30 to 50 blows per 10cm as being successfully densified. The excessively high blow counts were an attempt to try to drive through the injection zone to measure density at the lower elevations. The post injection P-1 penetrometer test at the northeast corner of the tank pad was attempted with the same results. The test was terminated at 1.9 meters (6.2 feet), with blow counts of 347 blows per 10cm. The preliminary P-1 test showed blows of 6 & 7 blows per 10cm at this elevation. The crew made attempts with a rock drill, to drill past the six-foot level and attempt a penetrometer test commencing at that point. We were unsuccessful in this attempt, as the densified soil continued to close and lock the drill steel in its hole. The steel had to be removed with the hydraulic ram. The penetrometer was only able to achieve an additional 20 more centimeters with blows of 126 blows per 10cm. The injection work was then considered completed. URETEK had calculated that this project would require injections at three elevation depths of 5’, 8’, & 12’ deep. The project environment actually and only allowed two injection elevations, one at 5’, the second at 8’ deep. The post penetrometer tests show a dramatic increase in the density of the foundation bearing soils. However, considering the tremendous point loading of this process tank, that the entire plant is founded on a medium stiff layer of soil at 9-feet deep. We feel that there will be some cyclical movement with the loading and unloading of the process tank. Elevation point monitoring should continue until it becomes apparent that equilibrium of the foundation has been reached, or that further adjustment is necessary. Finally, we strongly suggest to receive maximum benefits from URETEK’s Deep Injection Process that all joints around the foundation pad be routed or saw cut, and sealed with an elastomeric joint sealant designed for that application. The wide joint between the receiving room wall and the south edge of all the tank foundation pads, running east to west, should be cleaned out, fixed with a backer rod, and sealed its entire length with a flexible joint seal or sealant designed for its size and movement. The purpose is to prevent extraneous water from entering into the foundation area. After months of monitoring the tank, engineers reported that the tank settlement appeared to have ceased. Even though URETEK’s repair was not of historical proportions like the Leaning Tower of Pisa, we feel like it was a big deal for our clients and that is what matters most.